Yippi!!! Again? 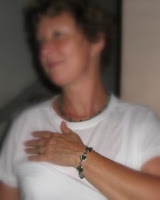 My twice around the world pretties is going "international" at last, as this green agate TWA wire wrap bracelet which I made this afternoon is now the property of this great lady. Meet my new "model", Karen who is from Calgary, Canada. She and hubby are on holiday here in Kuching and later on to Kota Kinabalu. She is my sis in-law's friend and now she has also become my friend. Been wondering how my pretties would look like on a "white lady" and I am not disappointed. Looks great and looks good!! :-). Out of respect and as per her request, I purposely blurred the face portion of the picture. But she is kind enough to let me post a picture of her with this bracelet. This is a present from me to her and I am so glad she like it very much. braceltet is very nice, are the instructions published in any magazines, I would love to learn how?